Tony Blair has launched his strongest attack yet on Jeremy Corbyn over his opposition to the Iraq war and for “standing by” as the Syrian people face bombing and starvation under the dictator Bashar al-Assad. Blair rounded on Corbyn after repeated criticism from the current Labour leader over the 2003 invasion as well his opposition to air strikes on Syria in November. “I’m accused of being a war criminal for removing Saddam Hussein – who by the way was a war criminal – and yet Jeremy is seen as a progressive icon as we stand by and watch the people of Syria barrel-bombed, beaten and starved into submission and do nothing,” Blair told Bloomberg. The intervention of Blair into frontline Labour politics, just weeks before the publication of the Chilcot report into the Iraq war, is unusual and marks an increasingly bitter disagreement between the two men. Blair, who won three general elections in his 13 years as Labour leader, spoke out against Corbyn in July before the veteran left-winger surged to victory in the contest to replace Ed Miliband. At the time Corbyn responded by saying Blair had a “big problem” in the form of the imminent Chilcot report. Today Blair painted Corbyn as a politician of protest because of his previous role as chairman of Stop the War – set up in response to the invasion of Afghanistan – and the 32 years he spent on the backbenches. “There’s a guy whose face is on the placard,” Blair said. 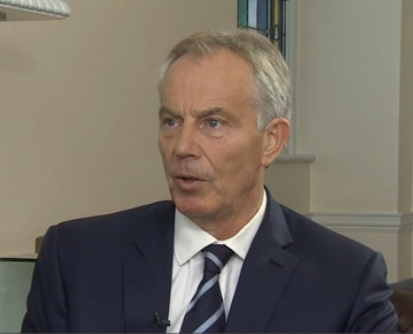 A spokesman for Corbyn said today: “What Tony Blair says is a matter for him. If he’s suggesting Jeremy Corbyn is leading the politics of protest, I would say that is not correct. “Jeremy Corbyn is leading the opposition and building support against the Tory government”. Corbyn faced one of his most difficult moments as Labour leader when the Government announced its plan to launch air strikes on Syria in November. Splits in the shadow Cabinet meant he was ultimately forced to allow MPs a free vote despite suggesting otherwise initially. Corbyn will not share a platform with Blair in the final weeks of the EU referendum, the Labour leader’s spokesman added.